Even though many companies struggle to create one (sure it costs time and therefore money) I will try to give a good starting point with the following operating model I have created. 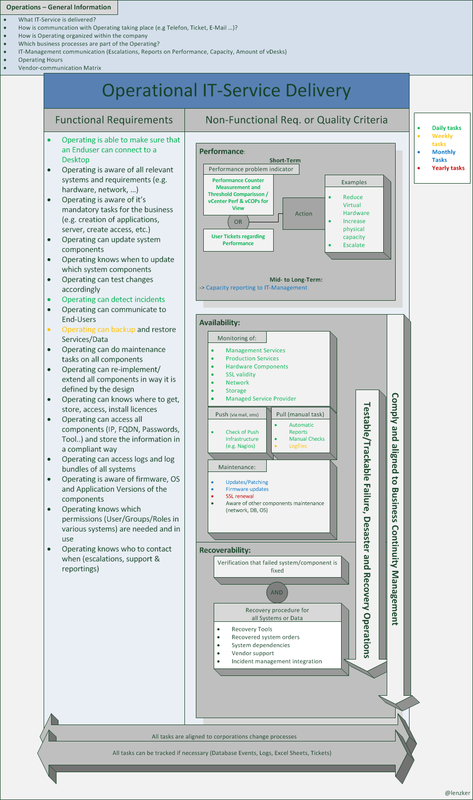 This model can be used for creating a new operations manual from scratch or if you just want to audit your existing manual. Please be aware of that this a generic model and is not specific to certain environments. I don’t claim that I know and included every important thing that must be included in such a manual… so feel free to give me feedback and I will update the document accordingly (if the discussion is leading to a conclusion which let the model evolve and bring more benefit to all of us). I divided the model in 3 different sections that must be in each operations manual. General information: Which IT-Service is delivered? Which communication channels are used? Which persons are important for the operating and during escalations? Functional tasks / requirements of an ops-manual (Does anyone has a better wording to describe those ?) : Concrete tasks and information that are done or used by operators/administrators to keep the basic functionality of the IT-systems. Non-Functional tasks : Tasks to ensure performance and availability of the solution. Those tasks ensure the quality of the environment and are typically separated in two phases – detecting and acting (e.g. failure & recovery, performance problem & fix). IMO those are the tasks that are really important to grow from a pure cost-driver within a company to a service-provider. A lot of organizations are having structured methods for detecting, but missing a well a structured process afterwards. At the end of the day I believe that each operations manual should give information about the mentioned items. Having a structured document with all of those information of the environment separates boys from men (from an organisational/maturity point of view 😉 ) –> so let’s grow up, create one and give me feedback about your experiences with those type of documents.